"I am the wrath of the Shadow Warriors. Fear me." Well hello all! I've been official with my modern set for 5 years now and it's finally time I bring my old Late Crusader character to life! Meet Atin Ordo! A lot of this armor is heavily based off of Rohlan Dyre's as I really like his kit, though this character has a bit more flair. 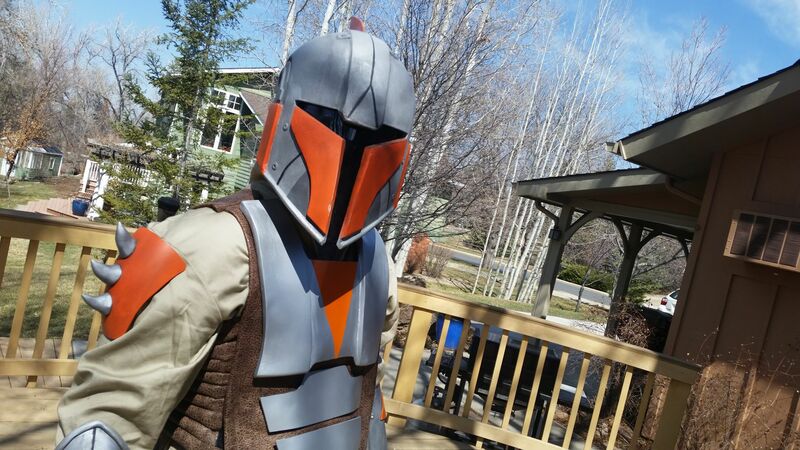 For the helmet, I will be purchasing one of these modified SWTOR Hunter helmets from a maker out in UT. As you can see from my sketch, I'm going to be doing some modification to the base helmet to give it more of a Late Crusader look by rounding off the raised cheek area, filling in the slots running along the top of the helmet, and filling in the square indents on the top. Beyond that, the rest of the custom mods are obvious. The idea with this is to replicate a similar design to Rohlan Dyre's but add my own twist to it. This is where I'd need feedback from the app team. 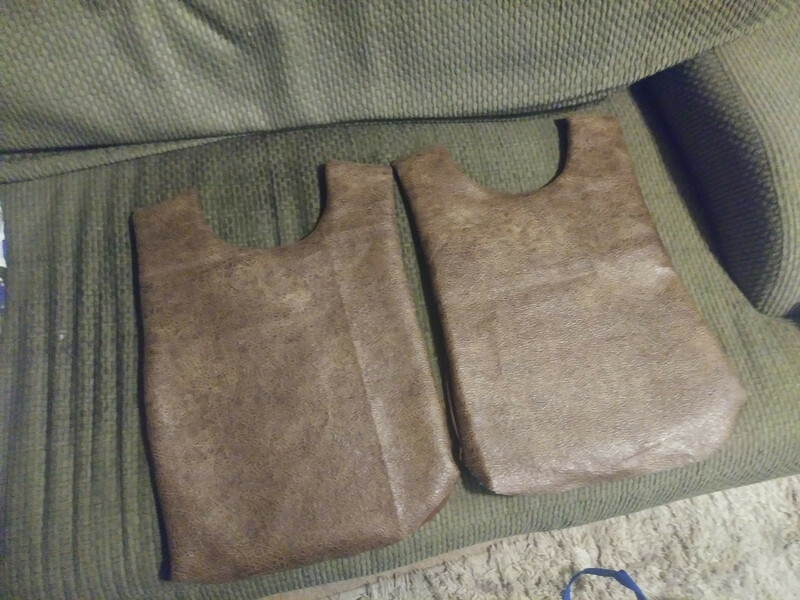 My idea is to make the underside of the vest essentially a "pouch" which I could put EVA foam inside to make the pleather vest look like thick soft armor. SInce the EVA foam would be completely concealed I would think there would be no issue, but I defer to the app team's judgement. Either way, it will be side closure with ribbed pleather. To create this effect I will glue a bunch of cotton stuffing onto a piece of pleather and then sew another piece of the same size on top, and sew rows of stitches to create the ribbed effect. I will have a leather pouch belt that doubles as a holster belt, a leather kama belt, and a rope girthbelt backed by suede fabric. All straps will be chicago screwed onto the plates either on the under side or through the plate itself. If the latter option, the screw will be bondo-ed over to conceal. 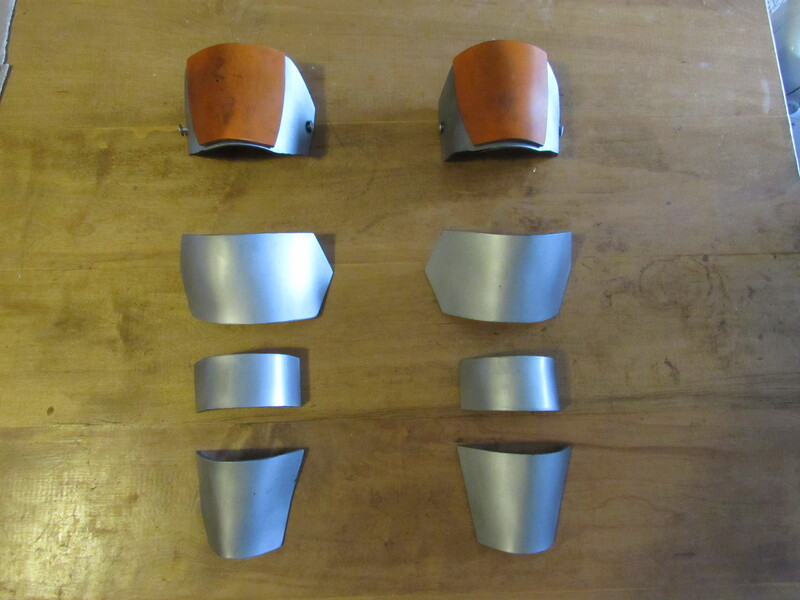 All straps will have metal buckle closures except for the shoulder armor straps. 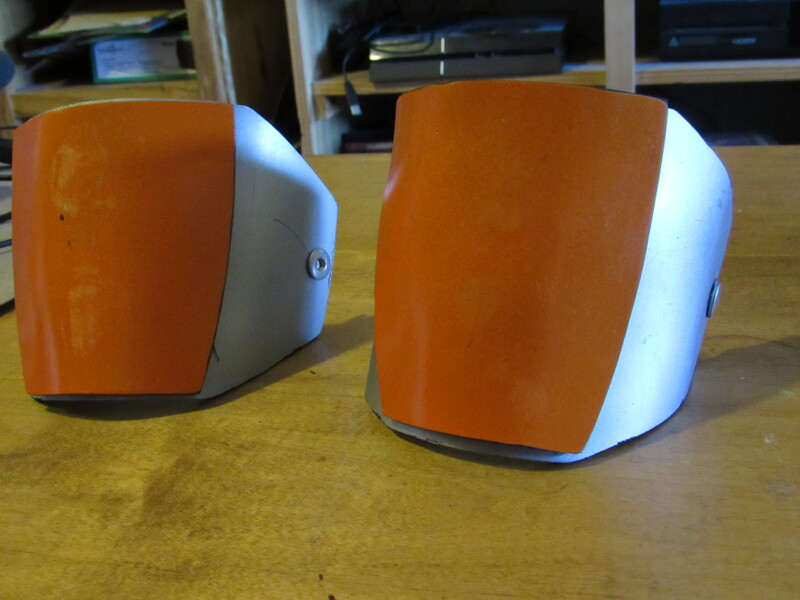 These straps will be permanently glued in place and the shoulder armor will be held on with either snaps or velcro. Boots will be plain side-zipping leather boots with a pleather covering to conceal the zipper. Closure will be snaps. 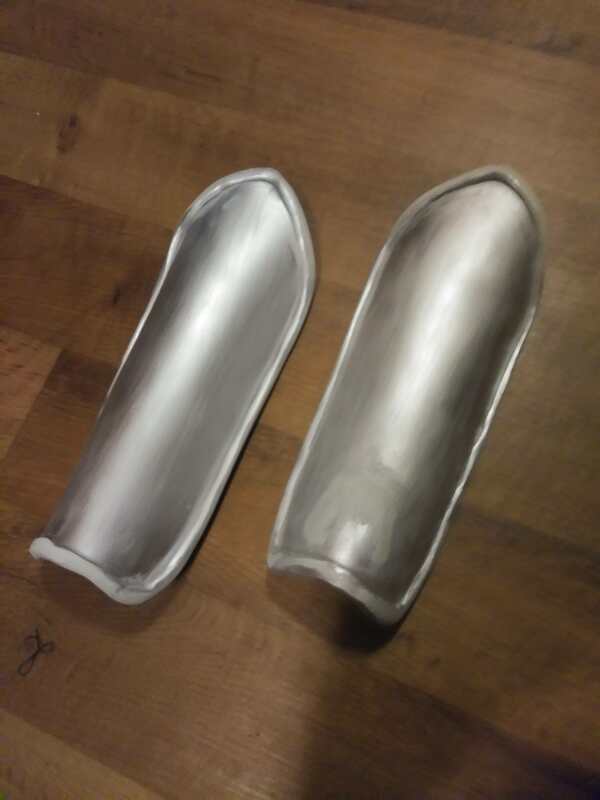 Boot and shin armor will likely be held on by chicago screws or pop rivets, and the rivets/screws will be bondo-ed over to conceal. 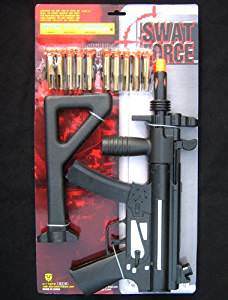 The pistol is literally an MP5 with the grip, magazine, and sights chopped off and a new coat of paint. I will be using this toy as a base. The pistol build will be fairly straightforward and simple. The plan was to make it out of ABS, but I'd have to get thicker plastic than I have at the moment to avoid flimsiness. I'll be looking into other ways to make it sturdy as well. 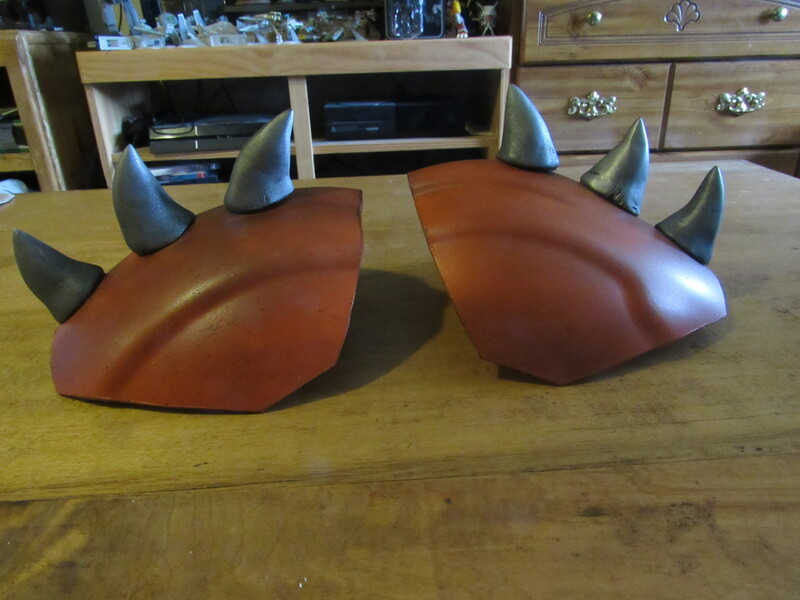 I have the bracers cut and formed and the trim is being done with apoxie sculpt. It was being kind of a pain and there's still a bit more filling to do along the edges to get it to the quality I'd like. Well, it's almost 1 AM so I hope I didn't miss anything. I look forward to questions and feedback! So the concept looks good, and I don't see any issues with it CRL wise. In regards to the vest....I am going to suggestion that you don't pad it with EVA foam mainly because it will GREATLY increases the chances of you overheating foam doesn't breath at all nor does vinyl and putting those two things together around your core under plates is going to make you get very warm very quickly. If you open to different vest material options. I would suggest a quilted cotton fabric it will give you some depth to the vest because it has a small amount of padding already and it will breath worlds better than EVA foam paired with vinyl and cost wise it really isn't that bad if you get a coupon to the fabric store which most fabric stores have a daily 50% of coupon you can use. Other than that I don't have much more to add at the moment, looking forward to watching your build come together. Really like this concept, Vod. 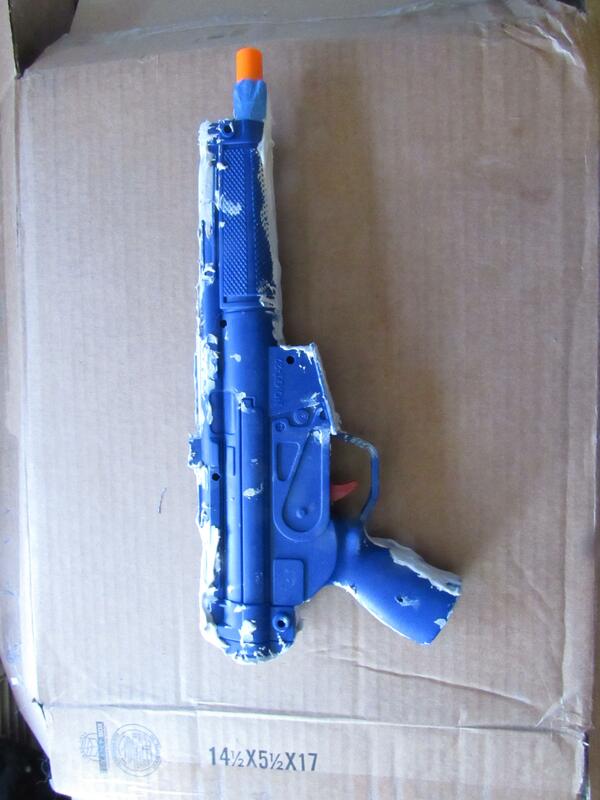 Nathan, I see what you're saying about the foam. Since the sides of the vest are relatively open I didn't think it would be that much of an issue. I've done full EVA N7 armor before with not much of an issue, but then again that was with a lycra suit. I think I'll give it a try and test run it. Worse case scenario is I pull the foam out and restitch the back of the vest so the pouch isn't baggy and showing from the sides. No harm, no foul. Thanks, Straka. I'm sure you aren't biased to the color orange or anything. Work has been pretty busy and I recently got sick (still getting over it) but I've made a bit of progress. 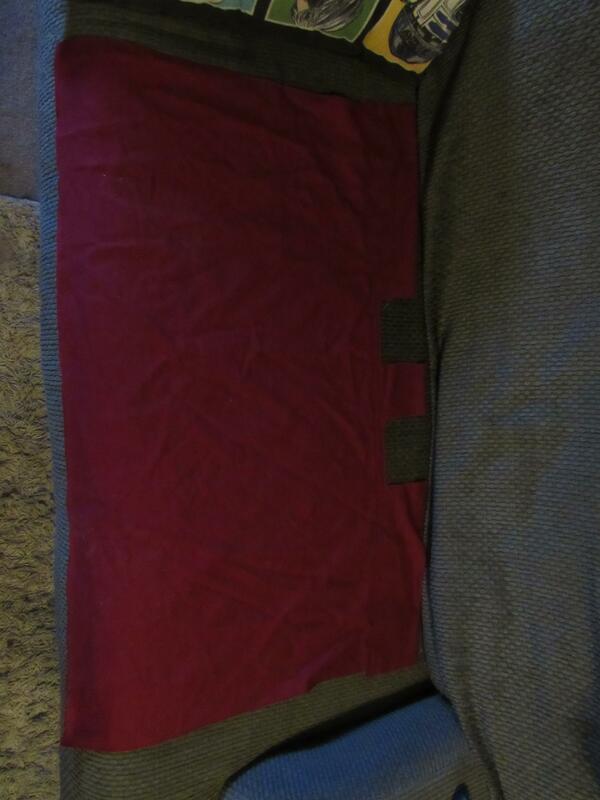 I got the front and back of the vest sewn but still have to sew them together and make the side closures. I'll sew up the bottoms once I make and sew the side closures into the back piece. 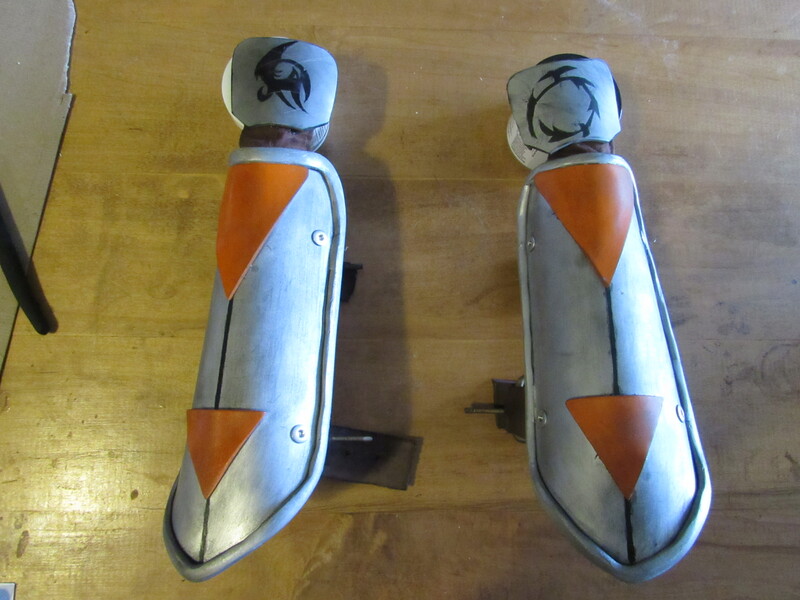 I got the detail pieces glued onto the bracers and added the black detail stripe. I forgot to get gold paint for my buckles (could only find them in freakin black) and the first straps I cut were too short because I'm a ditz. I'm going to hold off on black wash until after I make all the armor pieces because I'm not sure how much I want to do. It will make it easier to see everything in front of me. Well, I can't believe it's been a year since I lasted posted progress but I do have progress to report! I mainly got busy with life as everyone does but now I'm gearing up to try and get this wearable (maybe approved?) 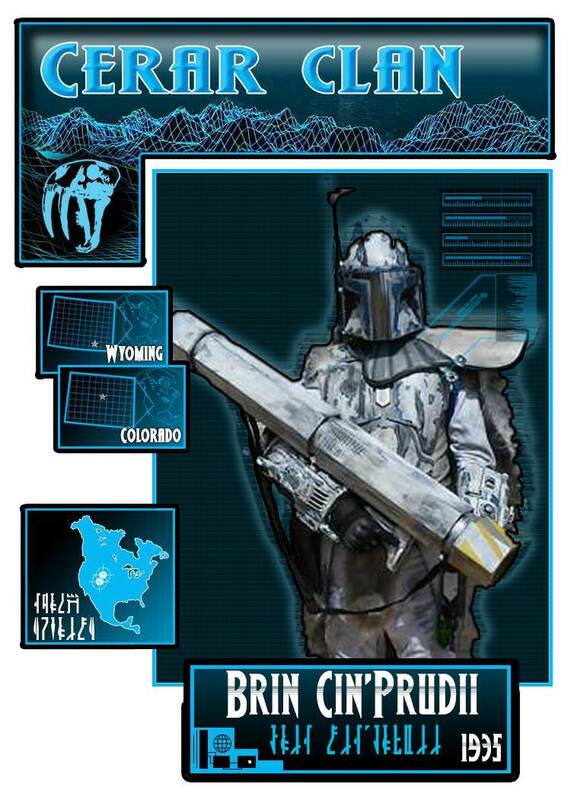 by Denver Pop Culture Con. 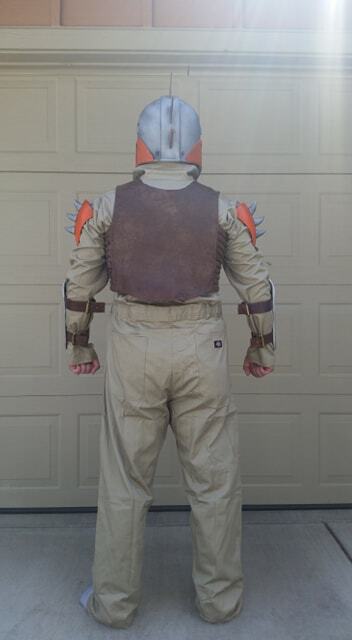 As you can see from the below pictures, I got the vest finished and quite a bit done. 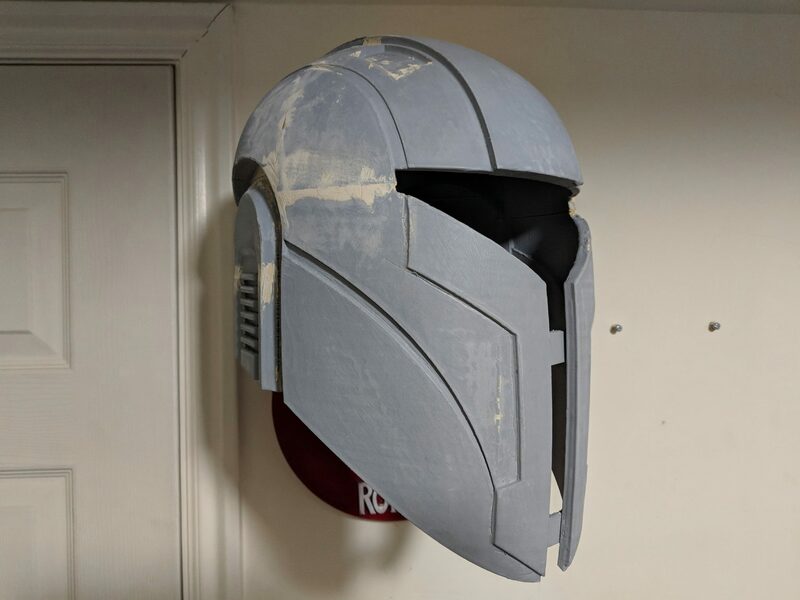 Ended up just going with a Mynock's Den SWTOR Hunter helmet. 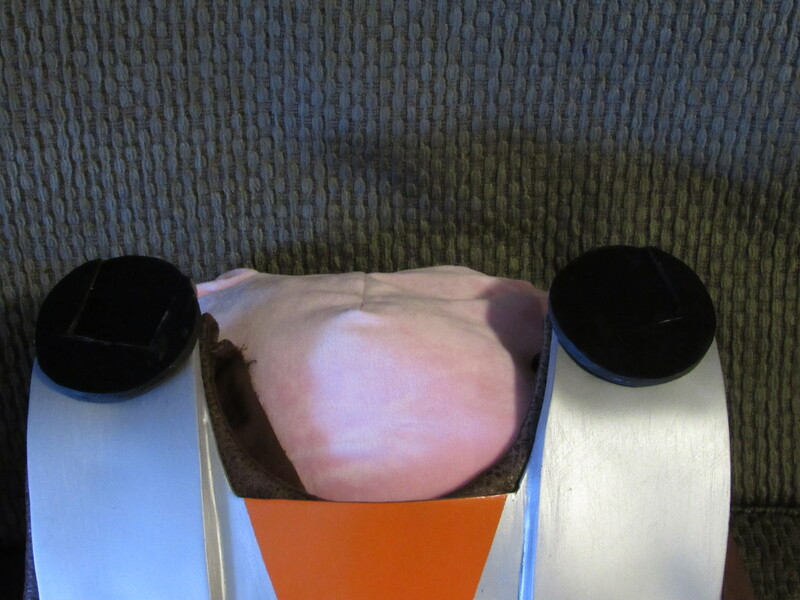 Plenty of customization was done such as bondo-ing the indents on the top, the "mandibles", and I covered one of the vents on the side with ABS plastic, as well as adding the fins. 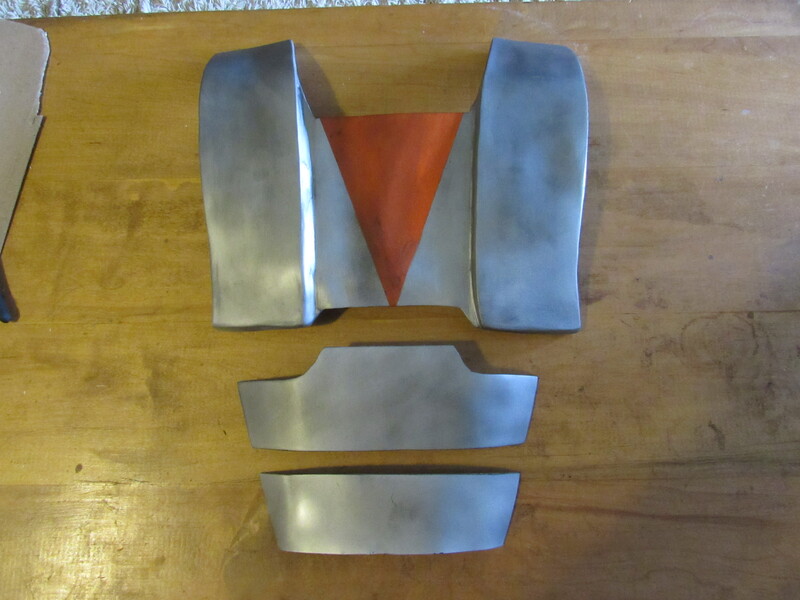 The chest armor was made from ABS plastic and the raised areas are just two sheets layered and glued with e6000. I'm not particularly fond of bulky shoulder plates but I'm wondering if they came out too small. I may go back and heat form them to open a bit wider and pull them up a few inches but we'll see. They are also rather flimsy as I don't have the leather strapping on the underside yet. Bottom ab plate needs slight forming at the sides. 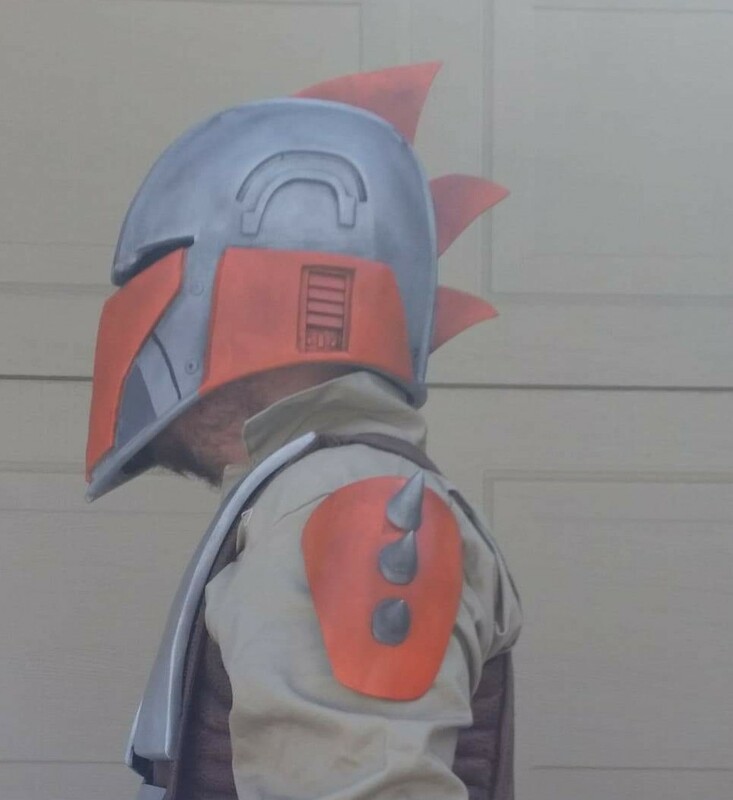 I still haven't finished the back armor but it just needs bondo, sanding, and paint. All chest armor still needs blackwash. Next up in the works are my cape clasps. Being black ABS, it's hard to make out but this is just representative of the size and placement. They just need some finish sanding and paint. 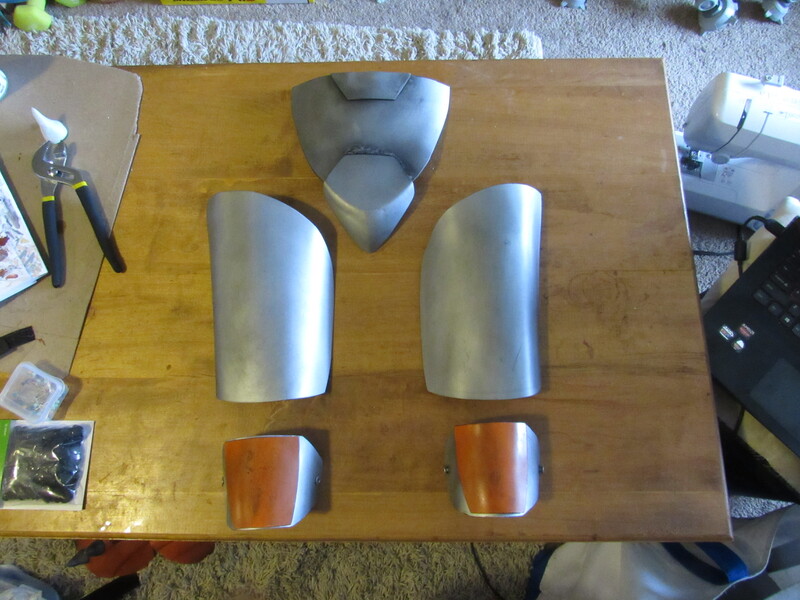 Next are my knee plates. Fairly straightforward. Still need blackwash. Kama which has not been weathered. I don't think I'll tear up the fabric too much but we will see how it goes. 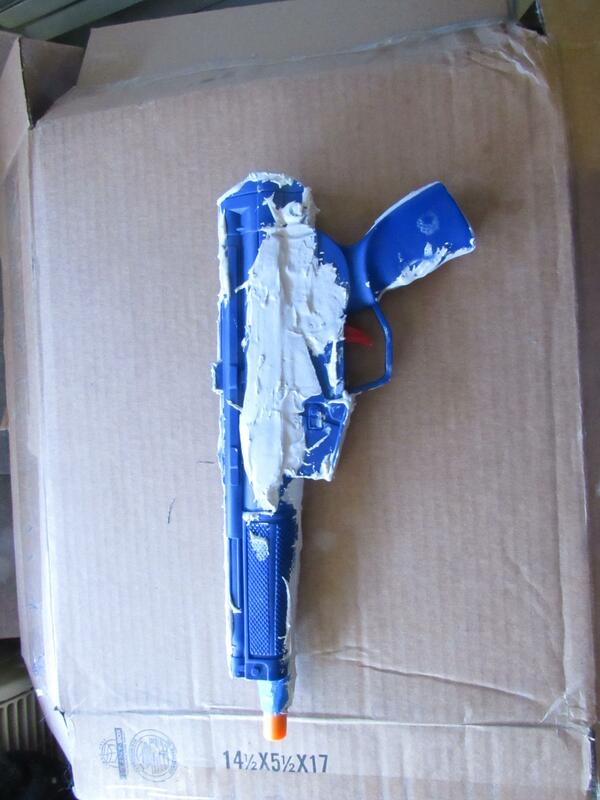 Lastly for now are pics of the Mandalorian Heavy Pistol. This thing ended up being around 13 inches instead of the described 7, so it's a literal hand cannon. 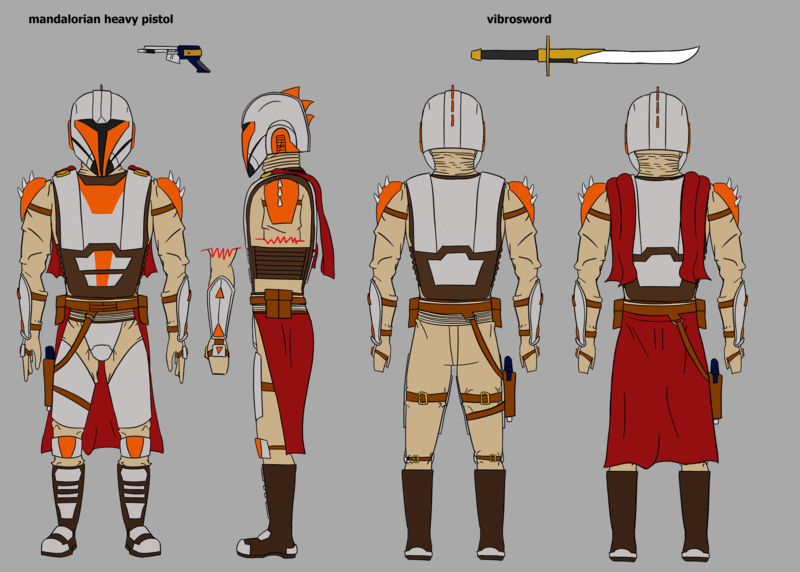 Works out in the end since most KotOR blasters are huge anyway. So, I have more stuff I haven't taken pictures of. All of my armor is complete save blackwash and the aforementioned finishing for the back armor. 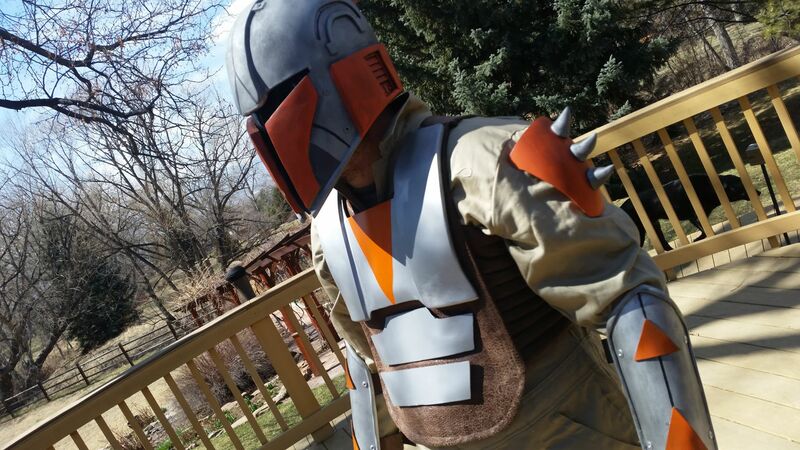 I do have gloves but they need some painting and weathering. My spats need some adjustment as the ones I bought looked a bit too pirate-y. I do need to make a neck seal but I'm not sure how to go about that yet. I also need to take in the legs on the flightsuit and perhaps the arms. Off the top of my head, I believe that is it! Are my shoulders going to present an issue? Currently it looks like they don't sit correctly due to baggy fabric/no straps, but I'm not a fan of huge shoulder armor. Granted, they came out a bit smaller than I'd intended, I don't think they are tiny. It's mainly the difference between how modern and crusader armor sits. 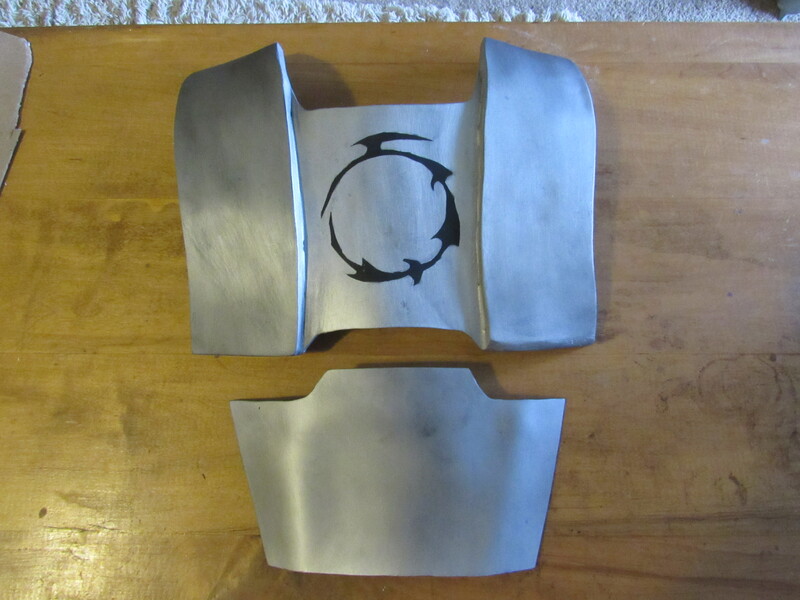 That said, I found a reference of some smaller shoulder armor for comparison. 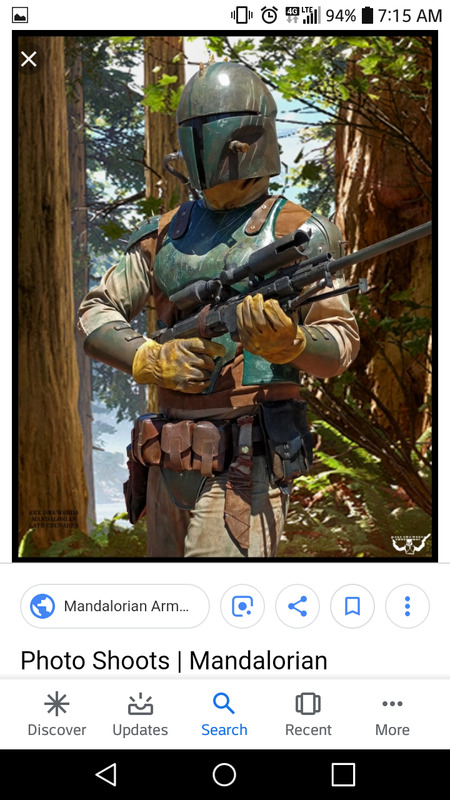 Are there any work arounds for not having to remake the shoulder armor? Perhaps a padded fabric section on the flightsuit between the vest and shoulder? 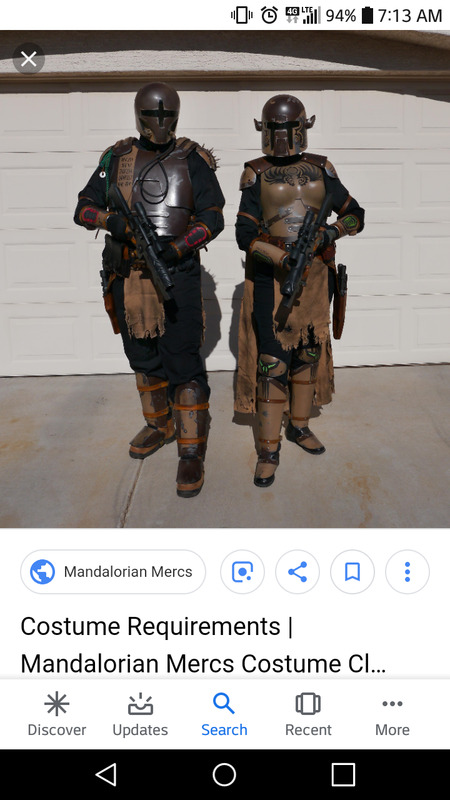 Or a leather cover like the female mando has? I was trying to keep some form of mobility but I'm trying not to go spend $40 on large pvc pipes to get larger shoulder bells. ~What killed the dinosaurs? THE ICE AGE! Overall I think the size is just a hair too small, could be remedied with maybe 1/2" around the edges. Granted some more tailoring to the flight suit could help that out - it looks a smidge too big across the shoulders and that might help the shoulders look not so small. The cape addition as well will help with that sizing when attached. Other than that - slight rotation to the ab plates (up on your right) would help a lot. Just a note for size comparisons on the two examples you show; we both used hard hats cut in half for our shoulder bells. 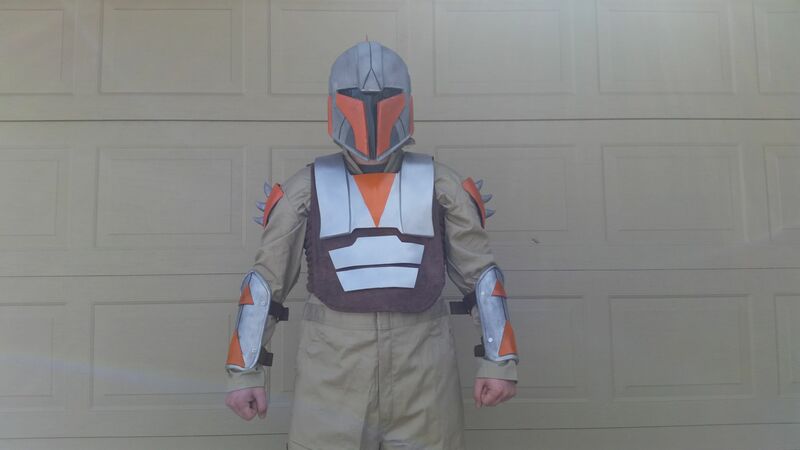 I got the idea from Ru'Der Marekar's LC kit. Overall I think the size is just a hair too small, could be remedied with maybe 1/2" around the edges. Have to agree with this ^ ^ ^ , just a hair too small on your shoulder bells and a 1/2" all around should help you out. Fair warning I like to take pictures and I've written a novel, so be prepared for both. Oh wow, I thought I recognized those! Haha. Neat idea. I'll see if I can heat up the shoulders and open them up a bit more. Try to put some ABS under it to make it wrap around more and then pull them up. Alternative is buying more PVC pipes which will be expensive for the larger sizes. Alright, I'm back with some more progress. 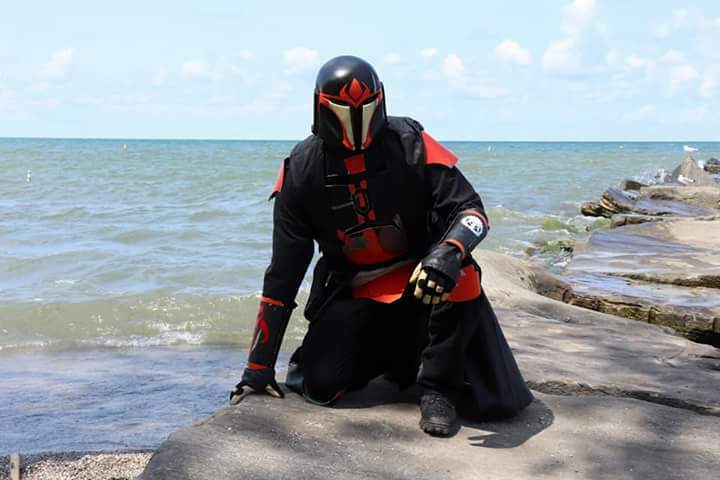 No test fit photos yet as I'm still tweaking the velcro on the flightsuit to get it just right but my armor has all been blackwashed save my cape clasps. I'm debating on potentially not having capes. Here's the new shoulder bells. Chest armor slightly reformed and fully blackwashed. Back armor finished and blackwashed. Bottom plate might end up being a tad long (I've already trimmed half an inch off the bottom) but we'll see how it fits on the next test fit. Cod, thighs, Knees all blackwashed. 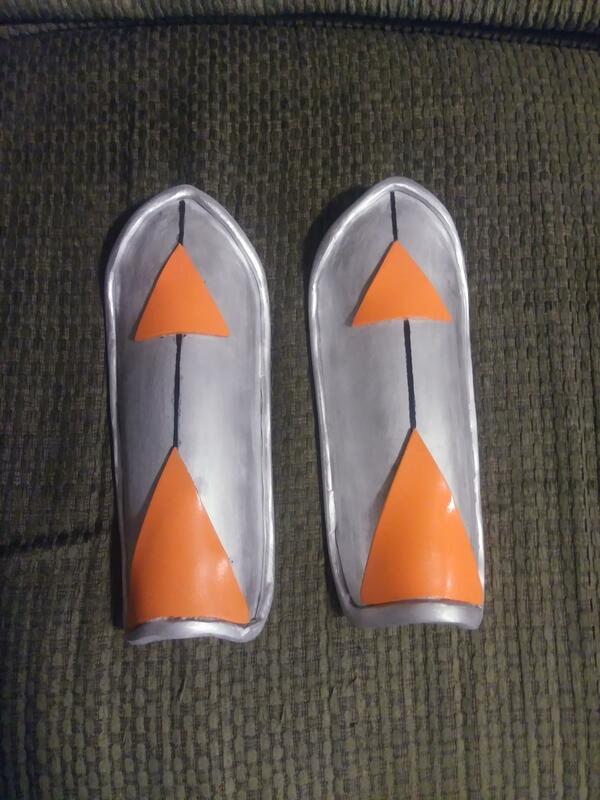 Last but not least, Bracers. Crusader kits always impress me. Nice work Vod! Don't forget to weather those LC decals on your backplate and hand plates. Can you make the AP on May 5th? I think we can get you apping by then.